If dropshipping is the wrong business model, then what exactly is the RIGHT business model? And the answer to that question is quite simple, really. Talk about helpful advice… I know. Now, I know that’s not the answer you were looking for, and of course if I left it at that then that would not be providing any useful information for you at all. But as some of you that have been here reading our blog or listening to our podcast a little while know, if you’re here looking for a shortcut to success, that is not what we’re about. You see, when I say “It Depends”, what I mean is “the right business model – for you – depends on… you”. Make sense? The right business model for you may not be the right business model for me, and might not be the right business model for others that you know. I want the big takeaway here to be that nobody can give you an answer to that question, except you. Not me, not your friends, not some random person on Twitter or in a Facebook group. I can tell you to learn as much as you can about the 9 best eCommerce business models that I wrote about here. And in full disclosure, there is actually a 10th ecommerce business model that I didn’t mention – licensed products – which can be great and very lucrative as well. I will get to that in the future, but really that model applies to only a very, very small percentage of you that own some form of IP, or intellectual property, that others might want to use on their own products. But when it comes to deciding which eCommerce business model you should choose, the first thing that you need to do is a self-evaluation. Assess your current situation before making a decision on which model is right for you to pursue. When performing your self-assessment, there are three key factors that will help determine which eCommerce model is right for you. Your previous eCommerce experience and overall skill level plays one factor in selecting the model that makes the most sense for you. If you are a beginner, then you definitely need to learn the ropes before you go all in on the wrong model. And when I refer to skill level, I’m referring to eCommerce experience – not digital marketing experience. Many times people think digital marketing is eCommerce, but it is important to differentiate that digital marketing is only one piece of eCommerce. If you only have digital marketing experience, that will impact which eCommerce business model is right for you. The second key factor to making a decision is the analysis of your personal financial situation, and how much money you are willing and able to invest in the success of your business. It costs money to launch a major electronics company or invent your own consumer packaged product, and really many of the most profitable eCommerce models. It can be very rewarding to do so, but financially not everyone is able to make that kind of investment in a business – yet. If that is the case, then you would start out with one model and evolve or grow into another model. Finally, the third key factor is assessing the time available that you can commit to the business. This is a critical – and often overlooked – factor in deciding which model you should choose. There are a lot of distractions in life that may keep you from being able to commit the time that it takes to be successful with certain business models. If you’re married, have 4 young children at home, and you’re working full time at a job that you hate – but need – then you’re going to have different obstacles than someone who maybe is single with no kids, and has money set aside to allow themselves to jump full time into launching their start-up. There are no right or wrong answers to any of these three questions that you must ask yourself, so it is important to be completely open and honest with yourself so that you can best position yourself for short and long-term success. Starting your own underwear brand from scratch would be awesome, absolutely. But if you’re just starting out, trying to learn the ins and outs of ecommerce, then the complexities of creating and sourcing a new product from a factory and launching a brand will complicate – and possibly overwhelm you – on your journey. When it comes to analyzing your experience, it is important to remember to walk before you run. Really, you may find that you need to crawl before you walk, walk before you jog, jog before you run, and run before you sprint. It depends on where you are at – personally – when it comes to your experience and your financial situation and your time commitments. If you have the experience, and available time and money to invest in building a business, then without a doubt the best eCommerce business model would be to create a product, either software or CPG product (which stands for Consumer Packaged Goods), but something that you can sell either Direct to Consumer or Business to Business. But while that is the end goal no matter where you start, I would strongly advise you to start at the level that is most likely to lead you to success. If you’ve never built your own website before, or have never done anything eCommerce or digital marketing related in your past (and/or perhaps don’t have a lot of money or time to invest as well) then you should probably start with the Affiliate Marketing model for your business until you can learn some of the basics to get things rolling for you. There are some very valuable foundational building blocks that you will learn by running an affiliate marketing business that you can use to start your next business – once you’re ready. 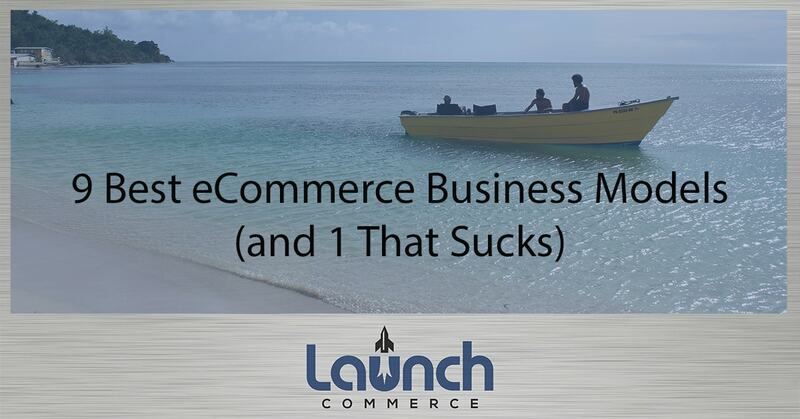 We won’t really be covering Affiliate Marketing much from a marketer perspective here on Launch Commerce. 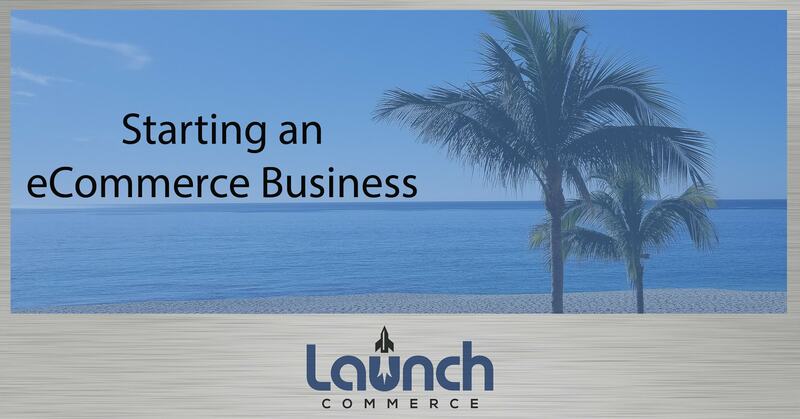 But that is part of how many of us got our start in eCommerce, and it is a fine first step into the eCommerce field. The other option – if you’re in that same situation but perhaps do already have a bit of online marketing experience – would be to start a “Print on Demand” eCommerce business. With Print on Demand, you can still create your own brand, with your own voice and your own message. You can still focus on delivering a great customer experience and building a community of customers that love you – all without having to buy inventory or worry about sourcing a product yourself. And if done well, customers may never even know that your product is made “on-demand” before you are able to transition into a more profitable inventory driven direct to consumer business. You still have all of the same objectives that you would need for building a successful consumer product brand – such as product design, digital marketing, merchandising and customer care – but without having to worry about some of the more complex and expensive aspects of eCommerce such as product sourcing, warehousing or fulfillment. And of course, there are other models in between these two ends of the spectrum, which sort of fit in accordingly based on your personal assessment. Once you have determined which business model is right for you, then the challenge shifts to deciding what exactly it is that you actually want to sell.